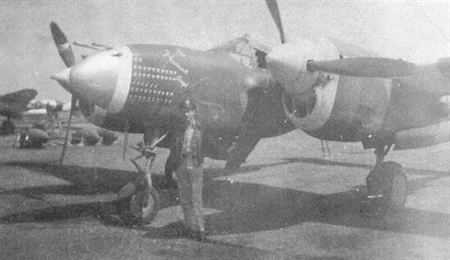 June 27, 1944 : 1st Lt Max Woolley and his P38 "The Homesick Angel"
The P38 Lightning "The Homesick Angel" crashed near gembloux after a dogfight above Charleroi in June 1944. The Pilot, 1st lt. max Woolley was safe and was hidden by a family in "Vieux Campinaire" until September 1944. On 5 August 2006, a small team of volunteers, supervised by Yves and Nicolas, gathered in a field in Cortil-Noirmont (near Gembloux) where a P-38 was deeply embedded in the ground by digging a huge crater. Despite several unsuccessful detections, Bart Beckers precisely locates the crash point in January 2006. The excavation is scheduled for early August 2006. The Bosch family, owner of the field, graciously put his equipment available and locations for cleaning and temporary storage. The crane liberates, less than a meter deep, a wing spar. A gray clay quickly appeared. It is related to a characteristic smell of fuel. The excavation begins with the central part of the plane. Three machine guns '.50' are quickly dug and the carcass of the 20 mm gun. These weapons are still keeping their serial numbers (MACR 6255); ultimate evidence of the identity of the P-38. The impact literally ripped and 'returned' the central pod. The dashboard is also discovering and various instruments, pads, switches, throttle, steering column, etc. Surprising are the excellent preservation of aluminium, ‘olive drab’ shade of camouflage and some 'grafitti' made by Lockheed workers. A part of an engine, a gear leg and a propeller blade are presented in BAPA workshop in Gembloux.